Based on characters from the TV show Marvel’s Agents of S.H.I.E.L.D. This first issue has to make it clear what universe the comic is set in, the TV/Film universe or one of the comic universes. That is essential so that everyone knows where they stand. How to tackle this in a clear cut manner while delivering a readable story is the crux. You’d expect marvel to be able to carry this off, especially with the experienced Mark Waid at the helm. It doesn’t take a moment to tell that this is not the TV/Film universe. A montage of Phil Coulson’s life from age nine to present. There are ample clues, including the fact that The Hulk was active while Coulson was a Freshman in College (University). These panels over three pages establish Coulson’s deep interest in those with super-powers, his determination, dedication to duty and, interestingly, a penchant for beating super-powered people in gambling (impossible to tell what game is played as the table is empty apart from casino chips). A heavy cast with several ‘talking parts’ and cameos from many well known characters. S.H.I.E.L.D. 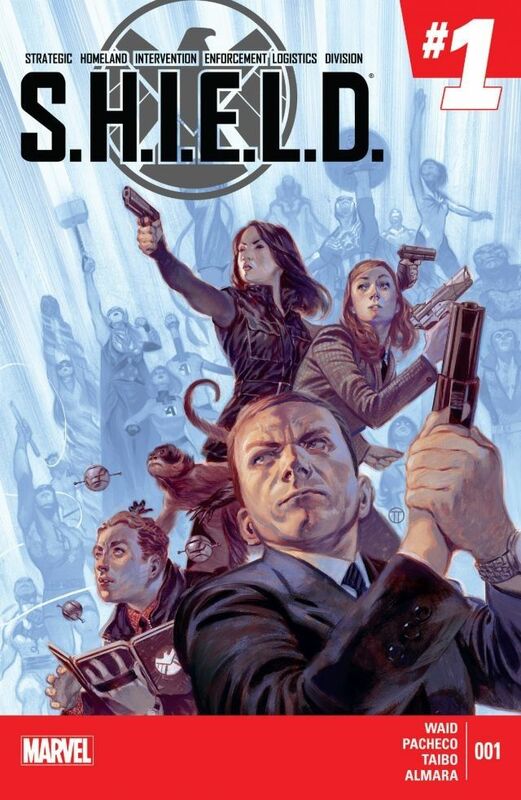 is represented by Coulson, May and the Fitz/Simmons duo, accompanied by two agents called Dane and Val. They are combating a threat worlwide with a number of heroes, Avengers and others, assisting at different sites. The scale of threat is high and the super-powered are used widely but in a way to show Coulson’s immacualte planning. Waid manages this within the first issue with the main threat apparently ended. Clearly this is by way of setting up the first story arc of the series. Some excellent pages of art, including a couple of very good reveals, well scripted and very nicely depicted, I’ll not give details as either might spoil enjoyment. I found the read satisfying and I know where I stand regarding the setting. I think I might have preferred a comic yie-in to the TV series but I am intrigued with how Waid has made these characters fit the main comic continuity. This entry was posted in Reviews and tagged Coulson, Marvel, Superheroes.